Foster by Soccer Dog Design - 6.875" x 10.000"
Foster framed print by Soccer Dog Design. Bring your print to life with hundreds of different frame and mat combinations. Our framed prints are assembled, packaged, and shipped by our expert framing staff and delivered "ready to hang" with pre-attached hanging wire, mounting hooks, and nails. There are no comments for Foster. Click here to post the first comment. 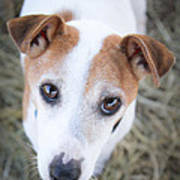 Foster arrived with stab wounds and starving at Georgia Jack Russell Rescue, Adoption & Sanctuary in late 2011. They nursed him back to health and he quickly found a home with a man who owns an organic farmer's market. He is happier than that. 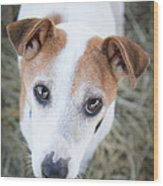 All proceeds from the sales of his photo will go to take care of other neglected, abandoned and/or abused Jacks who arrive at rescue like him. I love photography. I love Jack Russells. I love being part of a wonderful, nonprofit rescue group in Atlanta. The majority of proceeds from each sale of one of my photos will go to Georgia Jack Russell Rescue, Adoption & Sanctuary to help us continue rescuing and adopting out young/adult dogs and providing ongoing care for our special-needs and senior dogs.